Can Chrome take Firefox's crown of best Linux browser? How the mighty have fallen. During the early days of what some might, slightly hysterically, have called the 'browser wars' the two companies vying for browser dominance were Netscape and Microsoft. While this feud might have only directly affected Windows users, Netscape's demise and Microsoft's dominance in the late nineties left Linux users with oft-neglected browsers that sometimes struggled with web pages that had been designed solely with Internet Explorer in mind. The defeat of Netscape lead to the creation of Mozilla's Firefox, whose open source ethos complemented Linux's raison d'être. Its rising popularity helped level the playing field and finally lead to a well-supported alternative to Internet Explorer that was embraced by web developers. Firefox's success has been great for Linux users, but recently a series of unfortunate and baffling decisions by Mozilla has stopped Firefox being the go-to browser for Linux. One of the strangest decisions was to no longer support versions older than a couple of weeks. A habit of labelling even small releases as major version numbers - which some believe is just a superficial attempt to look like it's keeping up with Explorer and Chrome - has further served to alienate once loyal users. So change is once more in the air. With the rise of Google Chrome, and alternatives such as Rekonq and Epiphany growing in both confidence and popularity, is it time to ditch Firefox? Web browsers shape the way we view and interact with the internet, and that is why choosing the right one is so important. There are two major areas to look at - the front-end user experience, and the background technology. Testing the technology was relatively straightforward. Running the browsers in Ubuntu 11.04 we put them through their paces with a number of benchmarks including SunSpider, Peacekeeper and the Acid3 web standards test. For the front-end user experience we used real-world tests to measure how each performed when being used for day-to-day activities. This involved visiting a number of different websites running on different standards, such as the new HTML5. While the basic browser has to be stable and reliable it's the add-ons that enable you to really tailor it to your needs - they help expand the browser and allow it to reach its full potential. The vast majority are created by third parties and enthusiasts, so it's no surprise that the most popular browsers have the largest and most varied selection. Firefox has a huge number that cover everything from ad blocking and social networking to server side tools for web developers. Many of the most popular have been ported to other browsers. Firefox needs a decent system for users to find, download and install the add-ons they want. Mozilla doesn't disappoint with an excellent website that lists add-ons in categories, as well as making popular, featured and up-andcoming add-ons easily accessible. Download and installation is all done within Firefox, as well as updates. The Chrome Web Store is another well laid out resource. 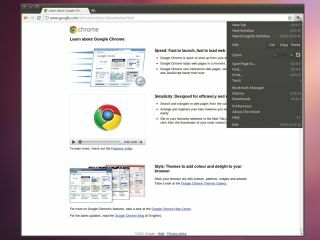 Chrome's rapid rise in popularity is reflected in a large library of add-ons that continues to grow. Traditionally, Opera has taken a more closed-source approach and been reluctant to embrace third-party add-ons. This has changed with version 11 and there are a growing number at www.opera.com/addons. A bit of digging should let you find a relevant add-on, though the selection isn't vast, and some remain in their early buggy versions. Opera was often seen as an innovator in browser technologies - but with add-ons it's still playing catch-up. Rekonq's focus on being as lightweight as possible means that addons are more of an afterthought. While an ad blocker app comes with the default installation, it does offer some support for Flash and Java-based addons. At present Rekonq sacrifices extendability for pure speed. While Epiphany is far more open to add-ons, its smaller user base has resulted in a limited number of official extensions, and most of these are more productivity orientated. Certificate Viewer and Greasemonkey are more representative of Epiphany's offerings - you won't find Facebook add-ons here. Mozilla's regular stream of updates often leaves add-ons requiring an update. An alert is helpful but can also be a bit frustrating. Other add-ons simply stop working with new versions. Firefox has developed a reputation for slowing to a crawl when too many add-ons are installed. Chrome's speed isn't affected quite as dramatically, thanks to it running extensions as a separate process. It seems that Mozilla has once again shot itself in the foot with its baffling decision to cut support for previous versions of Firefox. Firefox 4, which was only released earlier this year, is no longer getting vulnerability patches - effectively forcing users to upgrade to Firefox 5. New features such as the Do Not Track option, which prevents third party advertisers seeing your data, shows that Mozilla can still innovate. Chrome comes with sandboxing tools that add a further layer of security. Implementation of the Strict-Transport-Security protocol (Firefox needs a plugin for this) ensures that Chrome always uses secure connections for high-security websites. Opera uses SSL 3 and TLS encryption for secure websites, and along with Firefox, keeps the user updated with information about a site's security in the address bar. Visited websites are also checked against blacklists. Users are encouraged to submit any bugs or security flaws they find, and on average vulnerabilities are patched much faster than Firefox. Rekonq has had a chequered past when it comes to security, with some large vulnerabilities coming to light in the past year. This is improving, and there are some good features, such as the SSL widget that gives you a quick overview of the identity, encryption and security of any website you're on. Epiphany has a similar approach along with a pop-up blocker and cookie protection from untrusted websites. As with Firefox, Chrome and Opera you can also store passwords, though this doesn't feel quite as secure as with the other browsers.